Global shipments of NFC handsets jumped 10 times to reach 30 million phones in 2011, according to the latest research by Berg Insight. There were more than 40 different handsets from leading manufacturers - such as the Samsung Galaxy Nexus - released with NFC on board. And the growth trend will continue. 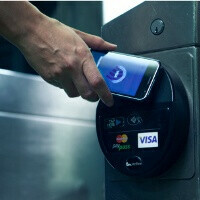 By 2016, the research firm expects there to be nearly 700 million NFC-enabled handsets on the market. “Even though it will take some time before the stakeholders agree on business models for payment networks, other use cases such as reading tags and easy pairing of devices may well be compelling enough for handset vendors to integrate NFC in mid- and high-end devices already today,” senior analyst at Berg Insight André Malm said. Android devices were among the first to feature NFC chips, starting with the Nexus S in late 2010, but in 2011 some flagship Android models like the HTC Sensation still lacked support. In 2012, most companies include NFC not only in high-end but in the mid-tier and even low-end phones. Samsung with its Galaxy Ace and Mini series is one example. One of the biggest - if not the biggest - swing factors for NFC is the next iPhone. So far, Apple has opted to include the low-energy Bluetooth 4.0 specification that can be used for purposes similar to NFC. With a thriving surrounding ecosystem, an NFC iPhone could give the needed push for NFC. Are you personally looking for NFC in your next smartphone or is this more of a theoretical advantage for you? Let us know in the comments below. Gothenburg, Sweden – March 26, 2012: According to a new research report by Berg Insight, global sales of handsets featuring Near Field Communication (NFC) increased ten-fold in 2011 to 30 million units. Growing at a compound annual growth rate (CAGR) of 87.8 percent, shipments are forecasted to reach 700 million units in 2016. The global rise in smartphone adoption is also driving higher attach rates for other wireless connectivity technologies in handsets including GPS, Bluetooth and WLAN. These connectivity technologies are already a standard feature on high-end smartphones and most medium- and low-end models. Declining costs will also enable broader integration in the featurephone segment that is rapidly gaining smartphone-like functionality. The attach rate for GPS among GSM/WCDMA/LTE handsets reached 31 percent in 2011 and grew to 38 percent for all air interface standards. Shipments of WLAN-enabled handsets have more or less doubled annually in the past four years and the attach rate increased to 33 percent in 2011. WLAN connectivity in handsets enables a range of use cases including offloading data traffic from increasingly congested mobile networks, media synchronisation and indoor navigation services. “Reliable indoor navigation systems for handsets need hybrid location technologies that fuse signal measurements from multiple satellite systems like GPS and GLONASS with cellular and WLAN network signals, together with data from sensors such as accelerometers, gyroscopes, compasses and altimeters”, said André Malm, Senior Analyst, Berg Insight. He adds that periodic calibrations using satellite and wireless network signals are necessary to compensate for the low data accuracy and high drift obtained from low cost sensors used in handsets today. The NFC technology for short-range wireless point-to-point communication reached a breakthrough in 2011 when several leading handset vendors released more than 40 NFC-enabled handsets. NFC can be used for countless applications such as paring devices to establish Bluetooth or WLAN connections, information exchange, electronic ticketing and secure contactless payments. “Even though it will take some time before the stakeholders agree on business models for payment networks, other use cases such as reading tags and easy pairing of devices may well be compelling enough for handset vendors to integrate NFC in mid- and high-end devices already today” concluded Mr Malm. I'm just hoping the iPhone 5 ships with it that way people will really start to adopt pay pass at places. I recently started using it on my Nexus and it's freakin' sweet but would be much better if everyone used it and once the iPhone supports it I think we'll be there. The question is - Was NFC one if the key factors which influenced the consumers to buy a certain device. If this is not established this 30 Million number doesn't mean much. if iphone 5 shipped with nfc, then that would really force everyone from phone maker to merchant to adopt it. Im hoping the leaked I-777 ICS firmware will enable NFC on my phone. Stupid to have if its not enabled. DAMN YOU AT&T!!! I am overdue for an upgrade phone on Verizon. I have decided that my next phone must have NFC and I am hoping SONY's Xperia line will come to Verizon and I am willing to wait. If I get a non-NFC phone now, I am afraid I would end up sitting on the sidelines for the next two years until the next upgrade while NFC finally takes off (hopefully soon). I am looking forward to not carrying 5 credit cards+multiple store gift cards and multiple ATM cards in my wallet anymore. Plus, NFC could also replace the more than 10 keychain tags that I now carry. Heck, NFC may even replace all the keys someday as well, starting with car keys since cars are becoming more and more computer centric. NFC is about exchanging information electronically. The uses for NFC can reach well beyond just handling credit card purchases. The uses are only limited by one's imagination. As far as security concerns go, nothing is 100% hackproof and the owner would have to exercise the normal precautions associated with anything that contains his private information. NFC will be just another choice. If you are worried then don't use it. No one is forced to carry credit cards either. Personally, I am all for NFC.